The first day of my MBA journey at Richard Ivey Business School is one I will never forget. I remember walking into my first class, with one of the outstanding faculty at Ivey, Dennis Shackel. We were immediately pushed outside of our comfort zone after he selected students at random to impromptu present (or sing!) in front of the entire class. That day, I knew, that the journey I was about to begin would be a transformative one. Our first semester just ended, and I am still catching my breath! Before pursuing my MBA, I worked for Manulife Financial as part of a Rotational Program, moving from Information Systems, to Product Development and finally Global Strategy. This was an incredible experience for me; My colleagues and mentors helped me to shape my career and solidify my career goals. As co-founder of Lean In Canada, I decided that after five years, it was time to embrace our mission and lean in to my own goals and aspirations of becoming an MBA graduate at one of the top business schools in Canada. As the months progressed, I was completely overwhelmed with the unique learning style, school work and group case studies. All of my classmates are outstanding, and sitting in on case discussions was intimidating. 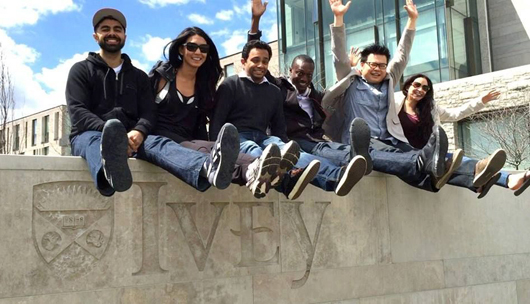 At Ivey, all students are high achievers and active participants, not only in class discussions but in extra-curricular activities. My peers have definitely influenced me in terms of how I approach business challenges, and have also motivated me to take more risks. One of my favourite quotes is by Alan Cohen; “there is more security in the adventurous and exciting, for in movement there is life, and in change there is power”, and this is truly how I feel today. I am so happy that I took on this challenge – I am pushing my limits and I recognize the importance of staying actively engaged and involved as well as being open to new experiences. In her book Lean In: Women, Work and the Will to Lead, Sheryl Sandberg states that women are less likely to go for “stretch opportunities” – an imperative part of the conversation as we work towards gender equality. This is clear as only 30% of my class are women. The group of women that I am a part of is absolutely incredible, and every day in class, I see stereotypes being challenged. I am proud to be a part of this circle, and I hope that more women take the leap as I can sincerely say the experience has surpassed all my expectations and has truly challenged me as a person. I still have 7 months left, and with the upcoming recruiting season, I know some of my biggest challenges are ahead of me. I will take every opportunity as a chance to grow both personally and professionally, and if I have learned anything so far, it is, to dream big and aim high regardless of what the outcome may be!